New Delhi : The function of Proteolytic enzyme is, in particular, to digest and breakdown proteins. These enzymes can be found in our body, and also in foods and dietary supplements. Recent studies have revealed that these enzymes have various health benefits, which has lend to its sudden growth of immense popularity. In this article, we are going to discuss the benefits and sources of proteolytic enzyme. Proteolytic Enzymes come to a great aid for various processes occurring in our body. This enzyme is released by the pancreas as well as stomach, and is also goes by the name of peptidases, proteinases, proteases. Their primary job is to breakdown the dietary proteins that we get from the foods we eat. However, they also play very crucial role in cell division, blood clotting, boosting of immunity, and so on. You can have a plant-derived proteolytic enzyme as they serve with great benefits. Proteolytic Enzymes are generally produced in our stomach and pancreas in the form of pepsin, trypsin, and chymotrypsin. These enzymes help in breaking down the proteins we usually get from meat, fish, and so on into minute particles or fragments which are known by the name of amino acids. It is these fragments that are absorbed by our body after digestion. Apart from this natural source, we can also get proteolytic enzymes from certain number of foods and from other dietary supplements. These enzymes can be received in high content from papaya and pineapple. 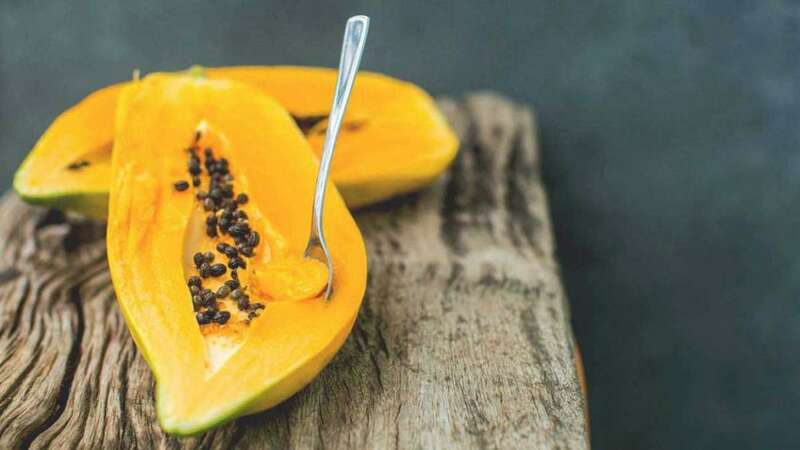 In papaya, there is an enzyme known by the name of Papain or Papaya Proteinase I, which is generally found in its roots, leaves, and the fruit. It is one of the powerful proteolytic enzymes and since ancient times, has been used in the form of meat tenderisers, owing to its capability of breaking down the proteins present in meat. Another fruit that is high in proteolytic enzyme is pineapple. Pineapples contain bromelain which is generally found in its skin, fruits, and in its extract. You can treat your body with the goodness of bromelain by eating a raw pineapple. Enzyme supplements can be availed in the form of capsules, chewables, gel caps, powders, and other forms. These supplements may comprise of a single enzyme or combinations of the same. In the combined supplements, enzymes like papain, bromelain, pancreatin, chymotrypsin, and trypsin are generally blended, and these enzymes are sourced from plants and animals. Note that it is necessary to take notice of the information regarding the potency of these enzymes. Some brands provide with insufficient information and just showcase the weight of these enzymes in milligrams. The most common units of proteolytic enzymes are USP, SAP, and HUT. Proteolytic Enzymes help a great deal in removing the stress or pressure of the digestive system in the digestion of proteins. Those having lack of these enzymes can get help from artificial introduction of these into the body. Studies have revealed that this enzyme helps a lot in reducing inflammation of the gut. Moreover, it has also revealed that bromelain and trypsin helps in reducing the pain and inflammation caused by osteoarthritis. Bromalain also reduces inflammation of nasal passages or sinusitis. As these enzymes help in the breakdown of proteins into amino acids, incorporating them into our diet would help in the improvement of our digestive system’s function. As proteins are effectively broken down into amino acids, it enhances the absorption of the same. Thus, with the ingestion of these enzymes, we also see an increase of the nutrient assimilation from the food we eat. These enzymes help in the maintenance of our gut and helps in keeping a healthy micro-biome balance in the same. Anyone suffering from the condition of food sensitivities and allergies receive great aid from these enzymes, as we have already mentioned that it boosts up the function of our digestive function. As things get digested easily, food sensitivities reduce. Proteolytic Enzymes help in boosting of our immunity system. Moreover it also reduces the issue of muscle soreness after an intense workout. Researchers have discovered that proteolytic enzymes can help the body fight against cancerous cells. The chances of autoimmunity response get reduced to a great extent when a person starts having proteolytic enzymes. It is because, as aforementioned, these enzymes strengthens and enhances the immunity system in our body. Bromelain, a kind of proteolytic enzyme has healing properties and also helps in reducing inflammation and pain. This is why doctors use bromelain in post-operative wounds to ensure speeding up of healing. How to buy Supplements of Proteolytic Enzyme? You can get these enzymes from the natural sources such as fruits and vegetables we have already mentioned, but if you wish to take the supplements, then consider buying them from the reputable brands which clearly displays the potency labels of the enzyme in their description. Moreover, only indulge in taking these supplements after consulting your doctor. Chymoral Forte: This medication consists of a combination of trypsin and chymotrypsin. It is widely used for its antioxidant and anti-inflammatory properties. It mainly helps in treating eyes inflammation, asthma, piles, and sore throat. Instructions: Chymoral forte are best effective when taken orally with water. Consult your doctor regarding the time of the administration of the tablets, and then maintain a properly and uniformly spaced interval between having the medication. Always try to have the medicine at the same time, as this gets the body habituated to properly work as per the medicine. So, now that you know about the benefits and sources of this enzyme, hopefully, it will help you lead a happy and healthy life.